Glamorgan's former South Africa batsman Colin Ingram has signed up for a further two years of limited-overs cricket with the county. The 33-year-old left-hander and leg-spin bowler has extended his contract to cover the 2020 and 2021 seasons. He will captain Glamorgan in the T20 this summer and could play in the One-Day Cup in the unlikely event he does not play the ECB's 100-ball tournament. "I've travelled a lot but Glamorgan is my cricket home," said Ingram. "I'm really excited to be coming back to a place where me and my family have really flourished. "We love the Welsh people and Cardiff in general, it is a place we identify well with because it is similar to where we are from in the eastern cape of South Africa." Ingram, who plays for Glamorgan as a non-overseas player under the Kolpak ruling, has become a globe-trotting specialist in the short format since giving up four-day cricket in 2017, partly because of knee trouble. Since last summer, Ingram has featured for Kabul in the first Afghanistan Premier League and Adelaide Strikers in Australia's prestigious Big Bash tournament. Ingram also had a spell at Karachi Kings in the Pakistan Superleague- where he smashed a career-best 127 not out off 59 balls against Quetta Gladiators. He will next move on to the lucrative Indian Premier League to play for Delhi Capitals. 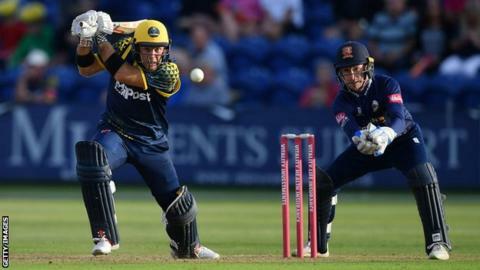 "It's a huge boost, to have Colin signed and sealed until 2021 is brilliant," Glamorgan director of cricket Mark Wallace told BBC Sport Wales. "He's proved himself at Glamorgan and now around the world to be one of the most dynamic T20 players in world cricket. "Colin absolutely loves Wales, he's totally sold on the place, and he's only ever wanted to play for Glamorgan [in the UK] since he made his debut, so it was a pretty easy sell from him to sign again." Glamorgan are still waiting for news on the availability of Australia batsman Shaun Marsh during the second year of his contract, since he is likely to be needed for the World Cup along with his 2018 Glamorgan colleague Usman Khawaja, who is also currently in the Australia one-day squad. They also plan to sign another overseas player for the T20 Blast, but are keeping their options open on whether to recruit a batsman, bowler or all-rounder.